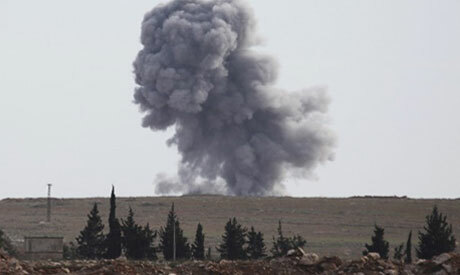 Syrian warplanes pounded an area near the rebel-held town of Yabrud near the Lebanese border Friday, a day after at least 17 jihadists were killed in fighting there, a monitor said. The Syrian Observatory for Human Rights said the Islamist fighters were killed during an offensive by loyalist forces backed by Hezbollah, aimed at seizing hills surrounding Yabrud, which is north of Damascus. Regime aircraft launched six raids on the Al-Aqaba region on Friday, according to the Britain-based watchdog, which relies on reports from activists and medics on the ground. The Yabrud offensive by Syrian ground forces bolstered by fighters from Lebanon's Shia Hezbollah movement, an ally of President Bashar al-Assad, is aimed at severing a key rebel supply line linked to the town of Arsal in Lebanon's Bekaa Valley. Hezbollah says that car bombs used to attack the movement inside Lebanon originated in the Yabrud area and were driven to their targets via Arsal, a Sunni town where support for the Syrian uprising runs high. In Syria's central province of Hama, meanwhile, at least 14 members of the regime's security forces and nine rebels were killed in fighting for the town of Morek, which is on a key army supply route. Rebel forces seized Morek a month ago. And in the northeast, clashes erupted between government forces and the jihadist Islamic State of Iraq and the Levant after midnight around the regime's Base 17 camp near Raqa, the Observatory said. More than 140,000 people have been killed in Syria since the start of a March 2011 uprising against the Assad family's 40-year rule. The revolt initially took the form of peaceful protests but escalated into a civil war after the regime launched a brutal crackdown on dissent.